If the world’s largest cooperative scientific program, the CERN accelerator, tells us anything, it is that the dominant paradigm of scientific thought has resulted in us most valuing the direction of thought from the micro to the macro: from our sense that the particles that result from our analytic activity are the most sure things. Feeling that we have found certainty from the bits, we move on to the whole, and that is how we have sought our explanations. The reverse flow – the macro informing the micro – has been diminished – as a capability, and in societies value. In education, the disciplines that work in wholes, art and poetry, have been treated as entertainments, not serious knowledge enterprises. Cars are complicated. Not complex. But in Complexity the whole is not the sum of the parts. Emergent properties are not arrived at by aggregating parts, nor understood by decomposing into parts. So what are we to make of our preference for parts over wholes? In complexity, studies of natural and human systems are explained by both kinds of analysis – micro (or analysis of the parts) and macro (or holistic analysis). So we must look at the macro, the whole. But in complexity this is not like looking at the “whole” of a car that comes off an assembly line. An intriguing feature that emerges in complex systems is in a sense obvious, but it is worth a second look. It is obvious that if something is complex, by definition we can’t reduce it to single dimensions. (If we could it wouldn’t be complex, merely complicated, like the car.) Indeed, we can only ever see a part of a complex system, based on where we stand as observers. a) It is therefore smart to relinquish the urge to find a single reductionist frame, which would necessitate us missing key information – and instead become deliberate (and eventually skilled) in viewing complex systems through multiple perspectives. b) Each perspective will be all the more robust and useful if we harness it to the fuzziness of language, to connotations, not denotations. For example, if we try to look at complex systems via rich metaphorical aspects: see a new business as a kingdom, a farm, or a garden, not as a choice between a hierarchy or a matrix. Perspectivalism- accessed in conversation – becomes foundational, an imperative, because of this phenomenon. It occurred to me while thinking about this “obvious” (but alien to us) need for perspectivalism that there was another whole issue between grasping complex systems and the role of perspectives. The laws of physics are constant everywhere, but perceptions of what is objective, and measurements of what is “real” are specific to each observer. • An observer on a train moving faster than you in the same direction may see you going backwards, and then as their train slows, see you start to go forwards and overtake them. If we take this last frame from physics and apply it to complexity, we get an insight as to why complexity theory is so hard to define. It is because it is, in its nature, a bunch of observer perspectives. This is generally true of human cognition about systems: “A system is a way of looking at the world” (4) But it reaches a crescendo in the context of complexity theory. The frequently referenced features of complex systems – sensitivity to initial conditions, strange attractors, self-similarity or fractals, self-organisation, emergence at the edge of chaos, and the formation of fitness landscapes – are not so much invariant features of every complex environment, as features that emerge repeatedly. When we use them as windows on complex contexts, some show these features prominently, even archetypally, while others are less evident. What Jackson calls pluralism, my hermeneutics Prof preferred to call “multi-perspectivalism” – to acknowledge complexity that transcends our finitude, and deliberately develop a competency to circle around messes using different perspectives: and thus continue as agents in a world full of messes. Multiple perspectives are not the accustomed way of thinking for managers. Management has chased the ideal of science, and the manager has chased the role of the scientist – one who pursues a single perspective as an objective observer, one who “gets to the bottom of things”, unearths the truth, comes to final conclusions. It is amazing that such a human discipline as management could have succeeded in suppressing the truth that different stakeholders have utterly diverse opinions about even the enterprise context they are involved with! So off you go. Go find some other people’s perspectives on your situation. But don’t forget to consider that conversation itself might be a perspective you could use! Conversations are the crucible in which humans build shared understanding, engagement and intent around a problem space. And, particularly relevant to our present situation in the world, conversation brings to bear the highest human capacity for facing complexity in real time. These are the indicators that you need a capability in conversation. Only in the brilliance of what humans can be when they talk together – using patterns that are crafted wisely – can we really be resilient in the face of complexity. Recommendations that are purely grounded in procedural control have an inevitable brittleness. 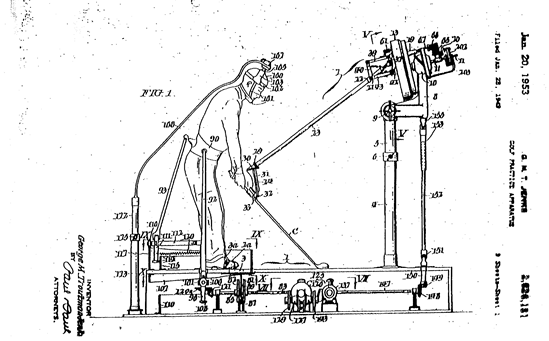 They are as misdirected as this patented machine for the perfect golf swing….